A gay couple, Freddy and Stuart, share a flat in London and a long-term love-hate relationship. There’s a pretty-boy upstairs neighbor, Ash, and a long-time friend, Violet, who is straight, female and perpetually single (I won’t say “fag hag” — oops too late). And there are a few tertiary characters thrown in for good measure. The entire setup is all very cliché — and I think that’s a fine thing. We don’t need to be challenged with the Gay Sitcom — nor do we need anyone trying to challenge us with it. These characters, situations and themes pave a well-worn road. There is an attempt at a post-gay, the-kids-don’t-care sensibility with 22-year-old Ash, who lives upstairs from the couple. (That he can afford to live alone in his Covent Garden apartment working nights at a dance club is another sitcom cliché we’re better off not questioning.) He gets it right away: His neighbors are a couple. So what? From the moment they meet Ash, Freddy and Stuart go through the requisite flirtations and advances. Ash lets it all roll off his back. Rather than scrunching up his face and running away — rather than letting the joke be Oh my god, can you believe those dirty old men? How disgusting. They’re not supposed to have thoughts, feelings or desires! — he sticks around. Because he likes them. He admires them. In this era after Will & Grace, we’ve seen all of the wackadoodle antics play out already. Where this show treads new ground, I think — where it might actually be, yes, daring — is in its depiction of the relationship between a young straight dude and his gay, gay, gay elderly neighbors. Stuart and Freddy are easily in their 70s. When the show opens, they have been together for 48 years. Their apartment has all of the charm and none of the sunlight of the 19th century (the curtains are almost never opened). And Ash looks at the pair like they’re the kind of guys he’d like to go for a pint with on a Friday night. Ash is constantly knocking on Freddy and Stuart’s door, seeking out their advice, their attention, their friendship. They are not just neighbors; he sees a real value in their friendship, unlike so many young people for whom the old are, at worst, an inconvenience, at best, invisible. To the show’s great credit, the only jokes against old people are from other old people. 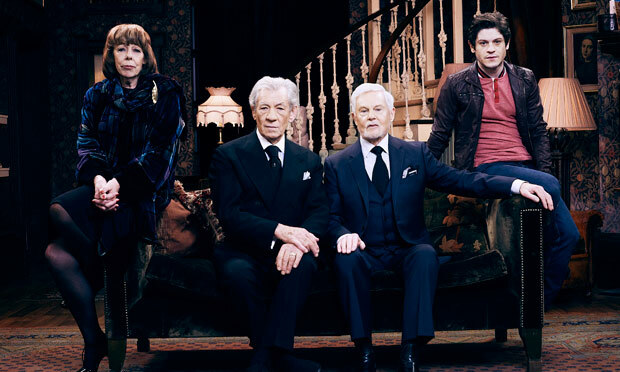 “Vicious” (the original title, as I understand, was “Vicious Old Queens”) aired in Great Britain last year, but I didn’t know about it until is started running on PBS. I was intrigued by the idea of Ian McKellen, who plays delusional out-of-work actor Freddy, in a sitcom. And truly, it’s just plain weird. Gandalf, Magneto, James Whale, Richard III — of all the worlds McKellen has inhabited, this is the strangest. But it works so well. It’s just like a play. Such greatness for the small screen — I almost expect Maggie Smith and Judi Dench to prance into the room at any moment. Instead, we have Jacobi cooing and prancing about like the second coming of Mr. Humphries, and McKellen hurling insults like circus daggers from the top of the staircase — from which he never misses an opportunity to enter the scene grandly. It’s less Folger Shakespeare Library, and more Folgers crystals. To my American ear, there is an old-fashioned Englishness to the mincing and the affectation, the tea cozies and the comatose dog forever sleeping in the kitchen. Surely the Brits must think so, too. Ten years ago, it might have bothered me, but not now. I find myself instantly liking it. I have come to think that most protests about gay men being portrayed as feminine are rooted in homophobia and misogyny. The very first syllable uttered in episode one is Stuart hooting into the phone as he chats with his mother. I say: Let that femme flag fly. More often than not, it’s the sissy boys who show real courage, not the guys who can pass as straight. As in most situation comedies, the situations are hare-brained and ridiculous. It turns out the best reason, truly, to watch is the chemistry between costars McKellen and Jacobi. The ensemble gets better with each succeeding episode, but the connection between Freddy and Stuart is intense and instant. The sharp contrast between their bouts of biting insults and the moments of surprising tenderness and affection looks as real as in any relationship I’ve experienced. Upon arriving home in one scene and seeing Stuart sitting on the sofa, Freddy exclaims, “I was hoping there might be an ambulance outside when I came home, and they would have already loaded you in.” Because the truth is, as the pair age, I know it gets more and more difficult for one to bear the thought of living without the other. The only way to fight through that fear is to mock death, ignore the closing grip of old age, and go for a few laughs at the expense of the one you love most, the only one who would dare forgive you for it. It’s funny, and it’s also believable, because through the rusted barbed wire, everyone can see the love they’re protecting, bright and clear as it ever was. Nice one, straight boy. Overall, there is a profound hopefulness to the series. Not only that relationships can last as long as 48, 49, 50 years, but also that someone like me can find some kind of happiness and contentment with a worthy partner and a circle of friends that just keeps rolling onward.